The Spanish Riding School of Vienna was founded in 1572 with Andalusian horses very appreciated by the courts of Europe for their elegance, their moods, their personalities.But from 1580 the import difficulties, particularly because of the war, lead the Archduke Charles II to establish his own stud farm in Austria, near Vienna, to raise horses for the Imperial Stables. 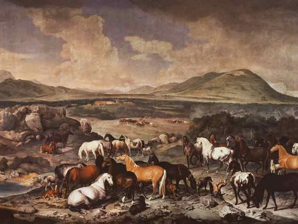 He chose the village of Lipica (now Slovenia) on the Kras Plateau (or Karst) - whose climatic conditions are similar to those of Andalusia and horses known since antiquity for their endurance and strength- and import from Spain first three stallions "Brincos", then 6 other stallions and 24 mares. It's the double crossing of imported horses with the old indigenous race of the Karst (or Kras) that gave birth to the race of "Lipizzan Horse". Subsequently the Court of Vienna dedicated to improving this new breed, will continue to buy more Spanish horses. From 1700, there will be new blood supply from standard Italian, German, and Danish origin of Ibero-Arabic. The stallions Montedoro, purchased in 1739 and Toscanello in 1749, began to transmit the gray wolf and pie robe, very popular at the time. 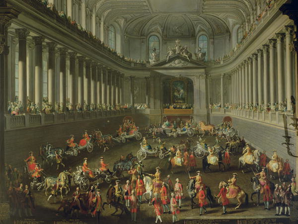 However, it is thanks to the infusion of Arab blood that was genetically favored the white dress, considered one of the "imperial horse" becoming then a feature of the race.The fixing of the type in its essential characteristics and its use of parade and battle horse already appear in 1735 at the inauguration of the Imperial Court Riding School of the Spanish School of Vienna. The Lipizzan will replace the Andalusian to remain until today the main actor of great carousels and imperial balls. ‣SIGLAVY: Arabian, born in 1810, creates a new and final line. There are two other stallions whose lineages persist to this day, the Transylvanian INCITATO and the Croatian TULIPAN. 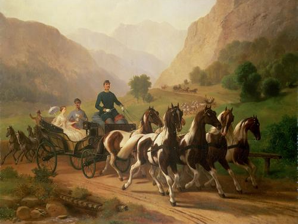 Originally, horses were called "Pferde Zucht der Karstes Lippizaner Rasse" (or Spanische Karster i.e. 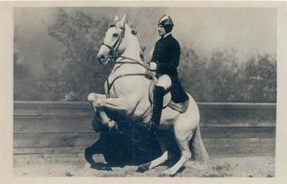 : "Horse of the strain of the Lipizzaner breed Kras". A l’origine, les chevaux étaient appelés « Pferde der Karster Rasse Lippizaner Zucht », (ou Spanische Karster) soit: « Cheval de la souche lipizzane de la race du Kras ». The name "Lipizzaner" was created in 1860 for the remaining horses in Lipica, while the semi-heavy italian line moved permanently on the orders of the authorities, to be breed in Kladrub, where they took the name of "Kladruber» . The various wars that set on fire Central Europe during four centuries will cause multiple outflows. The great traditional national stud farm are now in : Piber - Austria, Lipica - Slovenia, Djacovo - Croatia, Szilvasvarad - Hungary, Topolcianskiy - Slovaquia, Kladruby - Tchékie, Simbata de Jos - Romania et Montérotondo - Italy. Note that the spelling of Lipica in Austria is Lippiza, phonetical transposition of the Slovenian word (lipa: lime - lipica: small lime). The Italian writing "Lipizza", is only from 1918.